As human beings we are designed to move and daily physical activity is important for all of us at all ages. Unfortunately, the society we live in is becoming more sedentary all the time. The video at right is from designedtomove.org highlights the impact this is having on the future for our kids. Hockey is a great sport and it has some advantages when we compare hockey practices to practices in other sports. 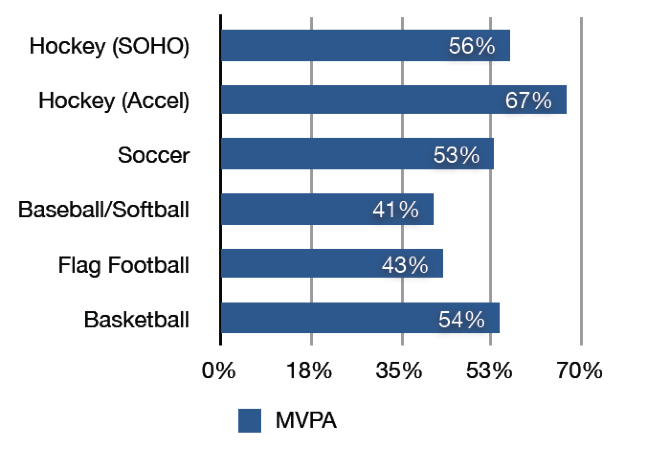 This chart highlights the amount of time spent by kids in moderate to vigorous physical activity (MVPA) over the course on a normal practice session in each sport. Study by Dr. Michael Kanters and NC State University. Hockey activity was measured by both a statistical observation protocol (SOHO) and with the use of three dimensional accelerometers. While hockey can do a great job for kids when they are on the ice, children need more than an hour of physical activity each day just to be a healthy kid, let alone an athlete. For more information on a healthy active environment for kids, check out the designed to move website by clicking here. To see an overview of the myriad physical and psychological benefits kids experience by playing youth sports, click the PDF link below.